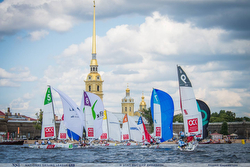 (St Petersburg, Russia)- The fourth regatta of the season for the Russian J/70 Sailing League took place in St Petersburg, Russian, with sailing taking place in front of the Peter & Paul Fortress on the Neva River. 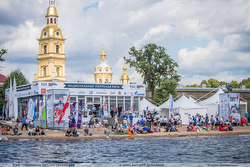 Twenty-seven teams participated in the event; including ArtTube RUS1 (Valery Kovalenko), Konakovo River Club (Dmitry Shunin), NAVIGATOR Sailing Team (Igor Rytov), Leviathan (Vadim Yakhinson), Calipso (Maxim Taranov), "Sail Lord- EUROPE" (Vyacheslav Ermolenko), PIRogovo (Alexander Yezhkov), Sailor EUROPE (Sergei Musikhin), Rocknrolla Sailing Team / RUS76 (Andrey Kirilyuk), St. Petersburg Yacht Club Academy of Sailing (Anna Basalkina), Region-23 (Evgeny Nikiforov), Black Sea (Carina Teliants), Navigator Sailing Team (Alexandra Peterson), DC TEAM (Denis Cherevatenko), ZID PRO (Zoran Paunovich), RUS-7 (Igor Ginzburg), X-Fit (Igor Ginzburg), Resourcekomplekt (Alexander Mikhailov), CSKA (Ilya Kozhevnikov), Imperial Yacht Club (Irina Sorokina), Sochi- South Sport (Alexey Krylov), KOMATEK Kochnev), USC (Boris Kucherenko), Parma Lukomorye (Vitaly Tarakanov), East-West (Evgeny Anishev), Skolkovo Sailing Team (Konstantin Umnov), and Yacht Club of St. Petersburg (Sergey Dobrovolsky). For the first two days, the fleet was blessed with strong winds and sunny skies. By the final day, an overcast sky with intermittent rains scattered across the northern capital of Russia, but it did not dampen the spirits of the sailors as they enjoyed more great racing in 8-14 kt winds. Forty-five races in total were run on the windy, choppy river course with each team sailing at least fifteen races. In the end, it was a surprising outcome for the incredibly competitive fleet at the top of the leaderboard. 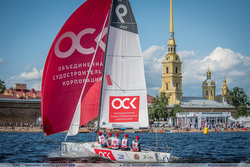 Winning the event by just a half point was CALIPSO, skippered by Maxim Taranov, with crew of Vladimir Shishkin, Egor Zuev, Dmitry Kolesnikov and Ilya Polishchuk. Just missing the gold was a new top woman skipper- Vadim Yahinson; by winning her last race, she led her LEVIATHAN team (Alexander Prokofiev, Maxim and Mikhail Sheremetyev) onto the silver step on the podium. Rounding out the top three to take the bronze was another woman skipper- Anna Basalkina and her crew of Ivan Zotov, Christian and Yakh Czech on the Y.C. ST PETERSBURG SAILING ACADEMY TEAM. The balance of the top five included two multi-regatta winners in the series; securing fourth place was Igor Rytov’s NAVIGATOR Sailing Team and in fifth place was yet another woman skipper- ARTTUBE RUS-1’s Valeria Kovalenko with her team of Alexander Bozhko, Igor Lisovenko and Denis Rozhkov. What was notable about this regatta was that for the first time in the history of Russian sailing and in Russian J/70 Sailing League history, three women skippers were in the top five (two on the podium) and were significant factors in the overall competition all weekend long! The next regatta will take place on September 20-23 at the unique sailing area in harbor of Vladivostok, Russia- the easternmost point of civilization on the Eur-Asian continent!